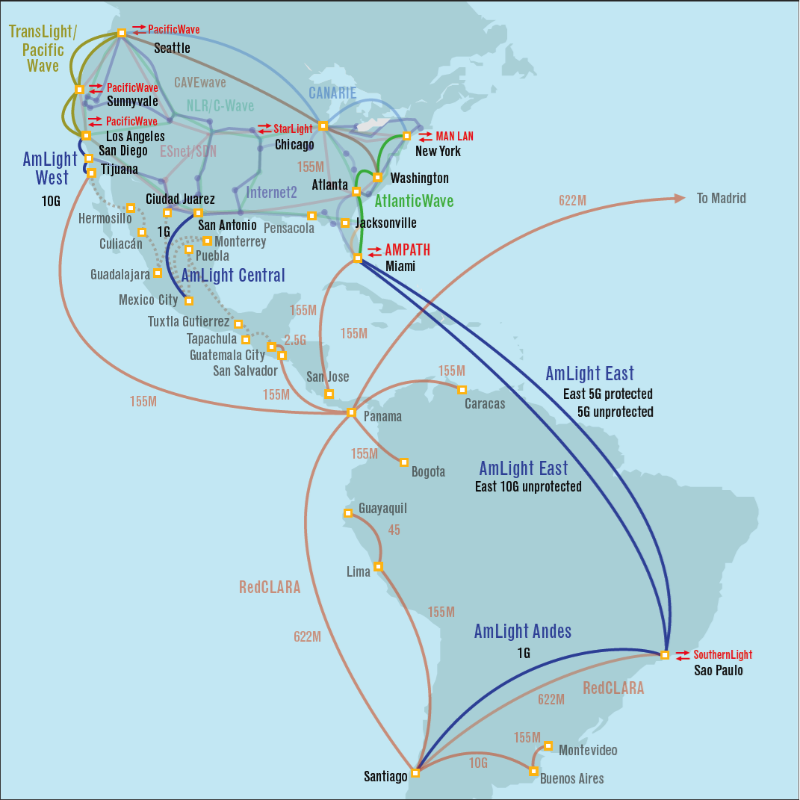 Americas Lightpaths, AmLight, enables research and education amongst the people of the Americas. The enablement is through the operation of production infrastructure for communication and collaboration between the U.S. and Western Hemisphere science and engineering research and education communities. The effort is fundamentally collaborative, encompassing the U.S. National Science Foundation’s AmLight support (Award #OCI-0963053) and committed financial resources of AURA , ANSP , and RNP , the resources of FIU and CENIC, AtlanticWave and PacificWave, and the networks of ANSP, CUDI, RedCLARA, REUNA, and RNP. Through AtlanticWave and PacificWave, there is production connectivity and peering to North American backbone networks Internet2, National LambdaRail (NLR), ESnet, and CANARIE. Through RedCLARA there is production connectivity to thirteen national research and education networks (NRENs) today with plans to expand to eighteen NRENs during the life of the project. These networks will enhance global e-Science collaborations through distributed production peering fabrics, as well as any research and education networks present or future that come to the AtlanticWave or PacificWave. Download AmLight Brochure here . (4) from the Corporation for Education Network Initiatives in California (CENIC) in Los Angeles, California to CUDI/CLARA Mexican / Central and South American exchange in Tijuana, Mexico (10Gb/s). The capacity and designs are based on collaborative funding over the five-year project plan, which are expected to evolve, and to continue to match the needs of the community. The focus of AmLight is to be an open instrument for collaboration, interconnecting existing points of aggregation, and providing a means to leverage collaborative purchasing and network operation in order to effectively maximize the benefits of all investors, and to manage the NSF investment in the context of international partnerships. AmLight will build upon the results of the WHREN-LILA project, award OCI-0441095, which successfully established a consortium to cooperate and collaborate among R&E network providers and users in the Western Hemisphere. 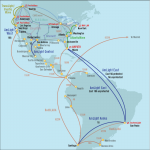 As a result of this work, a new era in Western Hemisphere collaboration began, which, prior to WHREN, consisted of five 45Mb/s connections between the U.S. and four countries in Latin America. Now, through successful collaboration, capacity is greater than 20Gb/s, with connectivity to every country in South and Central America, and one third of the Caribbean. For the first time, there will be sufficient network resources to incrementally enable the dynamic provisioning of switched virtual circuits to support the next-generation of e-Science across the entire Western Hemisphere and to other global regions where U.S. scientists, instruments, and facilities are located. A rational, elegant approach for leveraging the Western Hemisphere’s existing and future research networks, the Americas Lightpaths project provides the greatest benefit possible to regional science and education in conjunction with a flexible design that grows with the needs of the U.S. research and education community. Julio Ibarra, FIU, PI, has 20+ years of IT and Telecom infrastructure management, 10 of those years of specialization with international R&E network and project management. PI of WHREN (IRNC award for Latin America) responsible for the procurement, provisioning, and support of circuits. He provides overall leadership and planning for the project team and participates on the AmLight governance committees. Ibarra is a member of the Internet2 Standing Committee on International Strategy. Heidi (Alvarez) Morgan, FIU, Co-PI, is the Research Coordinator and work with the applications communities to ensure effective utilization of the network resources. Responsibilities include working with science groups to document their utilization of the network, and forecast future demand. She coordinates application specific key personnel. As the present PI of NSF CI-TEAM Global CyberBridges (Award # OCI- 0636031) and Co-PI of WHREN-LILA, she brings extensive experience working with diverse groups of science and research communities using advanced R&E cyberinfrastructure. Chip Cox, FIU, is the AmLight Project Manager and is responsible for day-to-day operations of the infrastructure. As the current COO of AMPATH, he has experience in the engineering and provisioning of network connections in Latin America, and project management expertise as a previous NSF program director. His responsibilities include coordinating network operations, deployment, and upgrades, ensuring availability of network resources, coordinating technology transfer to providers, and developing new pricing models for AmLight. Cox is also responsible for coordinating quarterly and annual reports of AmLight activities for NSF and external review. Louis Fox, CENIC, Co-PI, oversees the installation and support of the technology infrastructure for the Texas and California connections to Mexico. He has previous experience overseeing the engineering and provisioning of network connections to Latin America and strong project management experience spanning over 30 years. The AmLight project is made possible through the funding support of the National Science Foundation (award# OCI-0963053), the Academic Network of Sao Paulo (grant# 2008/52885-8), The Association of Universities for Research in Astronomy (AURA), Rede Nacional de Ensino e Pesquisa (RNP), Florida International University, the Corporation for Education Network Initiatives in California (CENIC), and the Lonestar Education and Research Network (LEARN). Full list of partners here.